FREETOWN—“There is nothing like this anywhere else in the country,” declares acting general manager K.T. Sawanneh. “It is the backbone of industry in Sierra Leone,” echoes Sylvester French, the man in charge of production. The object of their acclaim is a five to six-acre complex of yellow, cement and corrugated metal buildings known as the Sierra Leone National Workshop. Nestled on the western edge of Cline Town along the Freetown-Waterloo Road, National is known to most Freetown residents as a stop for poda-podas and taxis. Few have ventured beyond its iron gate to see the products displayed inside. National’s half-dozen or so buildings house the last remnants of Sierra Leone’s railroad era, a profusion of wood and metalworking machines originally used to maintain locomotives and rail cars. When the railroad was dismantled in the late 7Os, the government called in Hungarian experts to operate the workshop in support of the country’s hoped for industrialization. When the Hungarians withdrew in 1984, a new company was formed, the government holding 40 per cent equity, businessman Tony Yazbeck 25percent, and the public the remaining 35 per cent. Yazbeck was also granted a five-year contract to manage the company. At the center of the complex is a huge structure large enough to house several rail cars. Twenty feet above the floor, massive skylights pour sunshine onto a collection of lathes and boring machines that would be the envy of many a Western industrialist. Next door is a foundry used for melting scrap iron and casting new parts to customers’ specifications. The carpentry shop, with its wealth of lathes, saws, and planers, assists in this process by first creating a wooden model of the part, which is then used to make a mold for casting. A fully equipped blacksmith shop contributes anything that needs to be formed by hand. The sheet metal shop and welding shop fabricate production items like buckets, funnels, shovels, steel boxes, wheel barrows, and stoves. Motor repairs are done in the electrical shop, and a long-idle tool room is being revived to produce hand tools like hammers, spanners, and screwdrivers. For the moment the head and heart of the company reside in the person of Sylvester French. 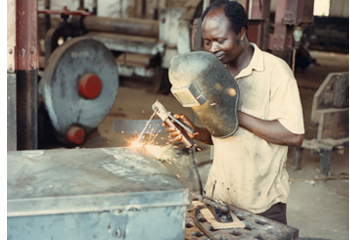 A well-travelled Sierra Leonean, French trained as an engineer in the U.S. in the early 1970s. Returning home in 1975, he set up a small agricultural tools company. Two years later he moved to Côte d’Ivoire to take up an engineering position in the green revolution program. Now back home after eight years absence, French has been appointed National’s production engineer. Together with his colleague Sawanneh, he hopes to move the workshop to the forefront of Sierra Leone’s agricultural development. The workshop has produced rice hullers, threshing machines, palm oil pressers, plows, and an assortment of hand tools using imported sheet steel and locally available recycled scrap. All fit the appropriate technology mold of simplicity, low cost, and durability. Most are French’s designs. “I’m the designer, mechanic, everything, because I have no help,” he says. Dwelling in the no man’s land between private and state ownership has presented identity problems for National. Managers brought in from the private sector are often in the same business as the workshop and thus have a conflict of interest. The government, on the other hand, seems disinclined to set policy and see that it is carried out. “The people in government, I don’t think really know the potential of this place,” says Sawanneh. With the current management contract due to expire this year, it will be difficult to chart a course until it is clear who will take control. Another potential problem for National is its ageing work-force. Many workers are holdovers from the railroad days and are nearing retirement. Some machines have only one qualified operator. French wants to set up an apprenticeship program to train young workers both for National and private industry. “We need to train for the future,” he says. “We want to do it, but we don’t have the directive.” Along with ageing workers there is a problem of ageing machines. “Our main problem is spare parts for these machines,” Sawanneh adds. Inadequate supply of electricity also hampers operations as National’s generator is incapable of supplying enough current to operate all the machinery. The problems are not insurmountable, however. A talented operations staff and core of skilled workers provide enough energy to overcome whatever bureaucratic obstacles are presented. If management and policy can be sorted out in the next few months, the National Workshop will be well in position to help lead Sierra Leonean development.